Korean-Canadian violinist, Esther Hwang, is known for her ability to captivate audiences with her virtuosic and passionate performances. She studied at The Juilliard School located in New York City under Professor Daniel Phillips. Born in New Jersey, Miss Hwang began her violin studies at the age of three and immigrated to Canada at the age of five. Her first appearance with an orchestra as a soloist was at the age of nine. She performed with the Vancouver Symphony Orchestra under conductor Ken Hsieh. Since then, she has garnered widespread acclaim and performed with various orchestras including Vancouver Symphony Orchestra, Vancouver Metropolitan Orchestra, Vancouver Philharmonic Orchestra, Haw Par Summerfest Chamber Orchestra, Canadian Music Competition Orchestra, and many others. Within the past two years, Miss Hwang participated in numerous masterclasses and lessons with world renowned teachers such as David Finckel, Wu Han, David Halen, Paul Kantor, Masao Kawasaki, Sylvia Rosenberg, Richard Aaron, Nam Yun Kim, Donald Weilerstein, Joel Smirnoff, James Ehnes, and many more. Miss Hwang has also achieved immense success in numerous provincial and national competitions such as the Shean Strings Competition (2016 and 2011), Canadian Music Competition (2010), and the Vancouver Women’s Music Society Scholarship Competition (2012). In addition to her appearances as a soloist and recitalist, Miss Hwang performed regularly as the concertmaster of the Vancouver Academy of Music Symphony Orchestra and the Juilliard Orientation Orchestra. She is also an active chamber musician as she was the first violinist of the Forza Quartet which won first place in the National round of the Federation of Canadian Music Festivals (2014). This past summer, Miss Hwang had the wonderful opportunity to participate in the Heifetz International Music Institute. 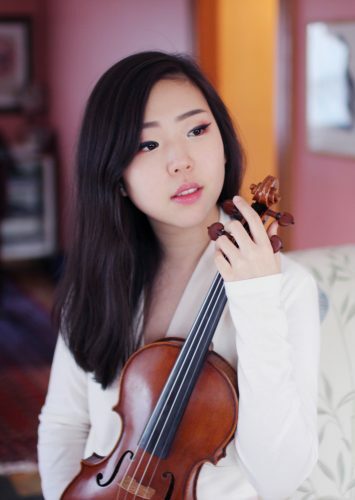 She was also a participant of the Banff’s Chamber Music Residency program (2015), Aspen Summer Music Festival (2015), Finckel-Wu Han Chamber Music Studio in Aspen (2015), Great Mountains Music Festival (2012), and the New York String Orchestra Seminar (2011), where she received full scholarship. Miss Hwang hopes to inspire the community and contribute to society through her dedication and passion in music.